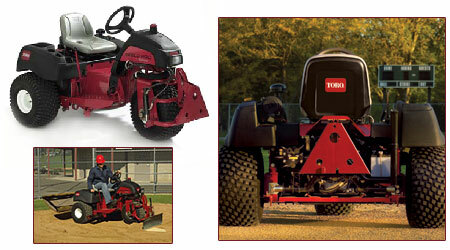 Apparently the “new” part is that you can install any of Toro’s 17 sand grooming attachments all over the Sand Pro via its quick attach system — without tools in under a minute — then motor around your own field of dreams with its 18 HP engine and hydraulic power steering chasing down cleaning up after baseball players. One good thing: unlike 3-wheelers of yore, you’re probably not in much danger of flipping the 930-pound Sand Pro; its 10 MPH speed limit puts the kibosh on wheelie time. Pricing is difficult to pin down, but we do know that each of the 17 attachements falls into the three-digit price range, and we suspect the Sand Pro itself falls firmly into the “if you have to ask” category.